Following the success of Pleasure Palace, Between Two Queens, and By Royal Decree, Emerson again plucks a real figure from history, this time Lady Anne Stafford. History remembers Lady Anne Stafford as the woman who cheated on her husband with both King Henry VIII and his boon companion, Sir William Compton. Lady Anne was in love two men at the same time . . . but the king wasn't one of them. 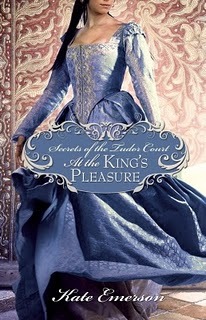 Anne Stafford's complex and often heart-wrenching relationship with the men in her life is at the core of Secrets of the Tudor Court: At the King's Pleasure. I have become so fascinated and thrilled at the number of novels being written about the time of the Tudors. My thanks to all of the authors who provide us with such interesting and informative reading. I will echo Connie's words. With all that is being written I am still not tired of reading another book on the Tudors. Well, I'm weary from reading the countless Tudor books. In fact I think the last one I read was by this author but I just couldn't do it anymore. I'm Tudor weary and I think I'll pass on this one too. The author is a good writer, I just can't handle the subject anymore. The cover has me drooling! That is a beautiful cover. I've read more about this lately and this book sounds facinating, thanks for the info! More Tudor intrigue. Fascinating woman. Lovely cover.